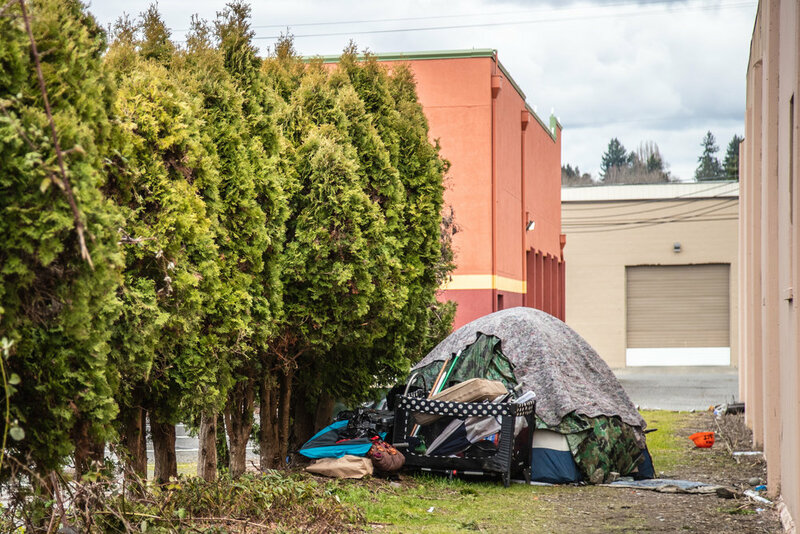 As of January 2018, there were 763 unsheltered people counted in Olympia and shelters were full beyond capacity. 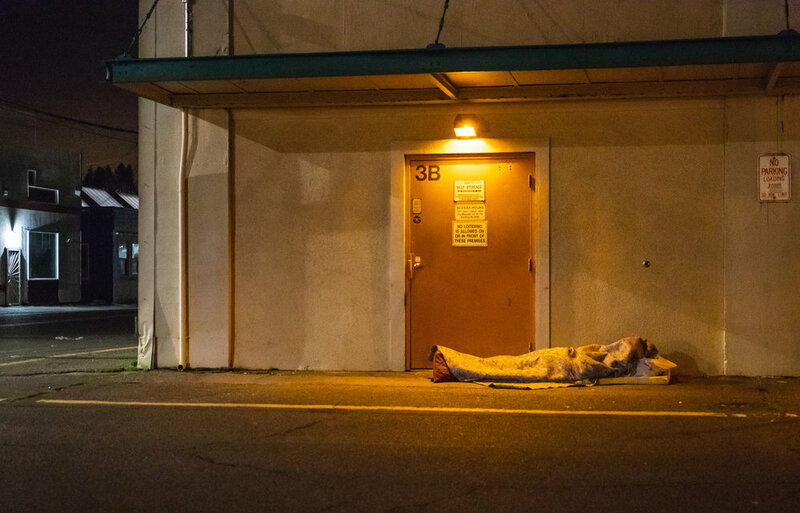 I’ve come to know many people who are homeless and living in Olympia, Washington. Many of the encounters occur just by crossing paths, ultimately leading to shared human experiences. These are the experiences where I had my camera with me. March 26, 2016: Jason sweeping litter out of an alleyway on Washington and Capitol. This is where our paths first converged. When he saw me, and a camera in my hands, he hollered “Hey, take my picture” So I did. If you ever meet Jason, he’ll likely have with him a broom and other cleaning supplies. He regularly picks up trash and sweeps the sidewalks. He opened up about his homelessness, mentioning that a few local store owners give him $4-5 a day each week for his cleaning. Jason is well known for spreading positivity and cleanliness to the city of Olympia. November 17, 2017: It was a cold night in downtown Olympia when I saw Joe standing with his bike at an intersection waiting for traffic to pass. I offered to buy him a slice of pizza, so we walked to Old School together. Joe was born in Olympia and raised in Rainer, Washington. He's an artist who draws portraits. He was the student body president his senior year at Rainier High School. He is a recent transport from Eureka, California. The night I met him he had been back in Olympia for just two weeks, living on the streets and in the woods. 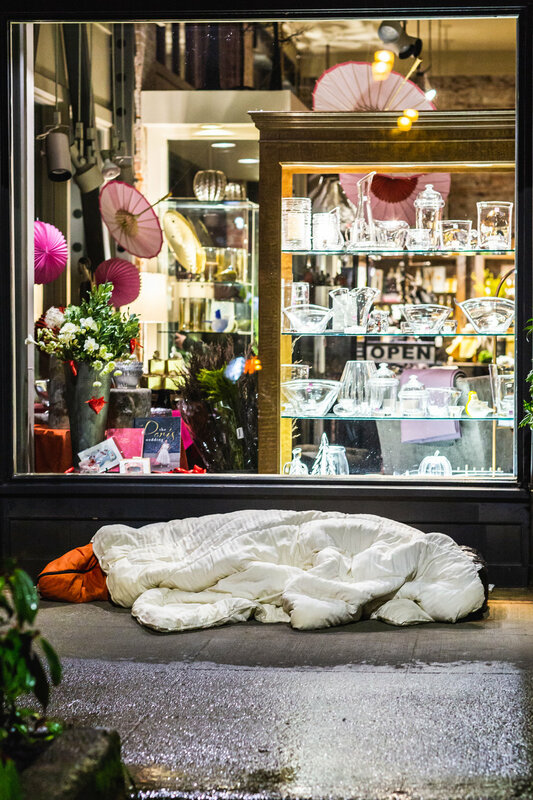 He spoke of the prevalence of homeless people shaming other homeless people. He talked highly about those who've helped him out along the way and how grateful he was. For this picture, he removed his hat to "show off" his hair. April 18, 2017: Moses was sitting alone on a bench along side a busy city street.. As I passed by, he asked for coffee and we began to talk. About 10 feet away from him was his luggage cart filled with things draped in black plastic bags sealed with duct tape and bungee chords. He told me, “ I keep it away from me because some women find it scary. They see me and they see all my belongings and they get scared. But you, you won't get scared." He proceeded to open up about his life. Moses born in Amaretto, Texas in 1944 and came to Olympia, Washington in 1990. Moses was abandoned by his mom and two brothers at an early age. His birth name is Jim, but he changed it to Moses when he began seeing similarities between his life and that of the biblical prophet. He compared the eruption of Mt. Saint Helens to verses in the book of revelations and drew other modern day parallels from the Bible. Before we parted ways I asked if I could take his photo to which he replied, "Of course, but know that if you're gonna take my picture you’re gonna get rich." July 18, 2016: This is Eddie, a Navy veteran born in Oklahoma City in 1944. Eddie's enlistment brought him west to San Diego. After serving from 1961-1965, Eddie got a job with General Motors at the Chevrolet plant. He later moved to Oregon in his yellow 1950 Ford V8 where he became a carpenter and a welder. 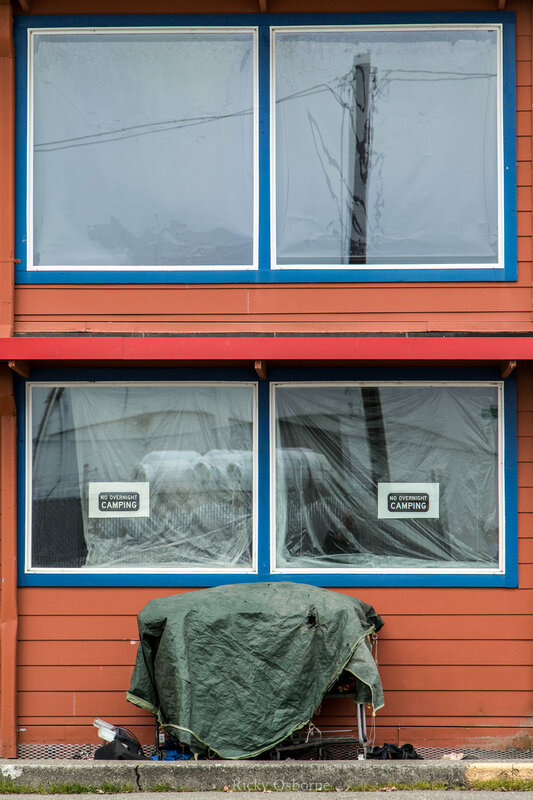 For the last 6 years downtown Olympia has been Eddie's home, "staying here and there with people who come and go." Before I left he said, "I'm grateful for a lot of things...just to be alive everyday." Melvie was sitting on the sidewalk with a rolled up newspaper in his hands. He asked if I played guitar as I passed by him.. When I said yes, a great smile appeared on his face. He tried guessing other things about me but was incorrect every time. Melvie Sheer is his current name. His birthday is unknown. He's had too many names, he said, because they change according to what town he's living in. 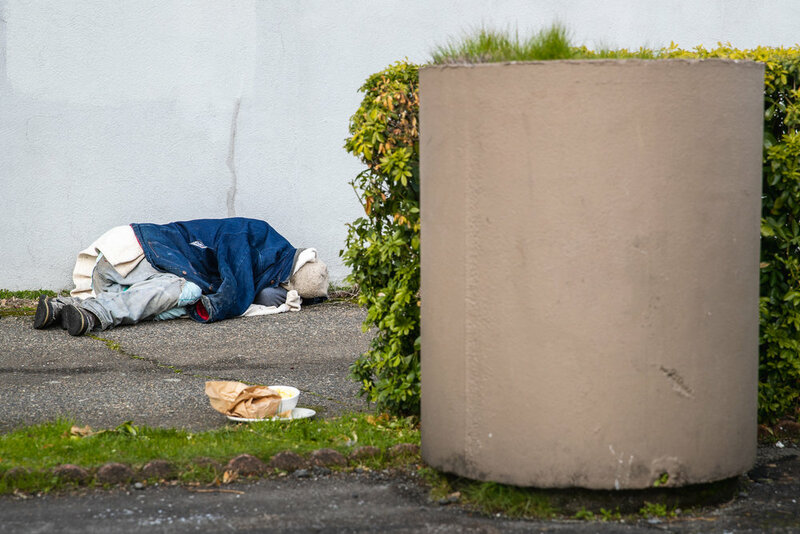 He sleeps in stairwells and stoops in Olympia. In 1971, in Littlerock, Washington, he was driving his Maserati when a truck slammed into him, causing severe head trauma. He didn’t know who, but he said “someone put me here after my injury. He currently has an untreated hernia. January 30, 2018: Standing with a small group of people at Sylvester Park draped in blankets was Eric. He’s 52. He grew up in Las Vegas playing in bands and performing as a singer. If you can't tell he's also a Dallas Cowboys fan. 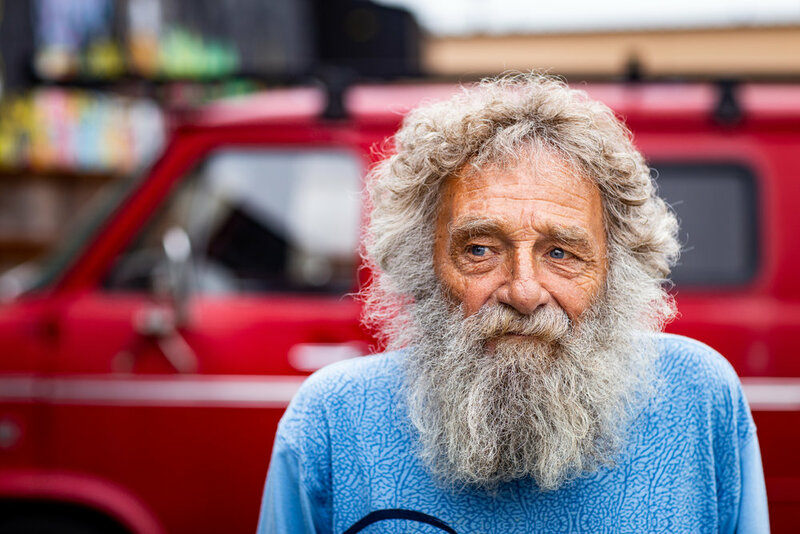 He's been living homeless in Olympia for 10 months now. He said he wants to get off the streets and see his friends do the same. 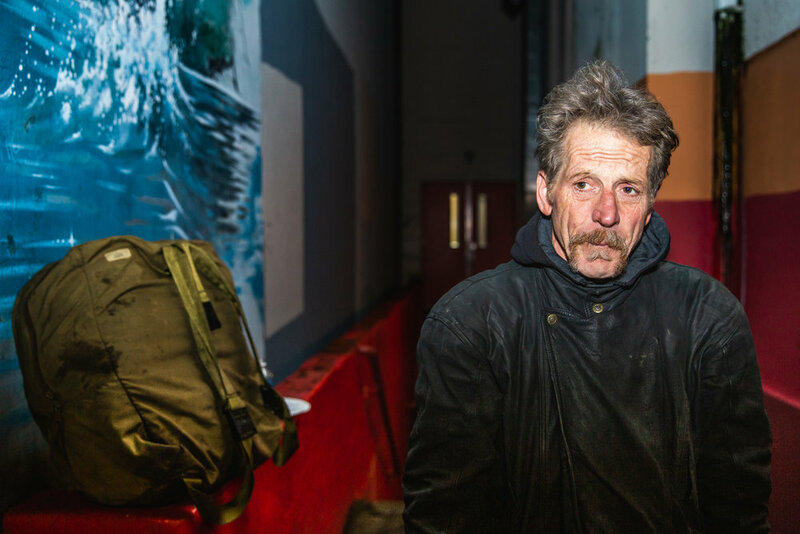 March 7th, 2018: Mike was a block away from the food bank, leaning up against a wall near the rail tracks with stacks of perishables at his feet. He was easy to to talk to. He is 38 years old and part of the Tahoma Indian tribe. He’s lived in Olympia all his life. He’s a “grinder" (skateboarder). 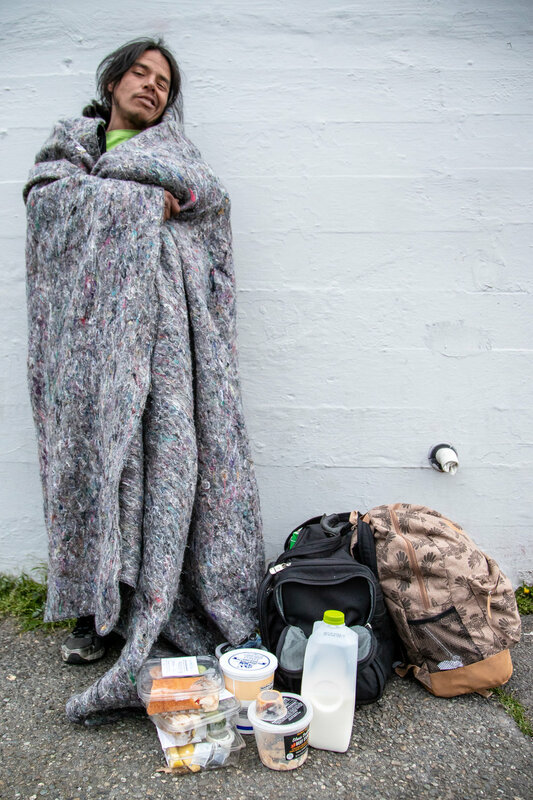 After a gallery showing at the former Cafe Vita, I was approached by the city of Olympia to generate photos of the homeless population for the 2018 Thurston County Homeless Census. Below are photos taken for this project.